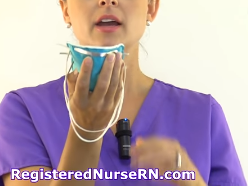 It is important a nurse knows how to properly don (put on) and doff (take off or remove) an N-95 mask. This article and video will demonstrate the proper technique for how to wear an N-95 mask. What is an N-95 mask? It is a special type of mask worn by nurses or other members of the healthcare team to prevent the transmission of airborne illnesses. 1.Cup the mask in your dominate hand, allowing the straps to dangle freely . 2. Place the mask over the nose and mouth by firmly pressing the nose clip on the mask over the nose and tucking the bottom of the mask securely over the chin. 3. Then take the top strap and place it at the top of the head. 4. Next take the bottom strap and place it at the bottom on the neck (do NOT allow the strap to rest on the hair of a ponytail but against the base of the neck). 5. Lastly, perform a seal check by breathing in and out forcefully and feeling for air leakage around the mask. (NOTE: every year you should always receive an annual mask fit test to ensure you have the right size mask). NOTE: DO NOT touch the front on the mask because it is contaminated. However, the straps are “clean” and can be touched. 1.Tilt the head slightly forward. 2. Then use your two index fingers and remove the bottom strap first by slowly pulling it over the head. 3. Lastly, remove the top strap, being very careful not to touch the front of the mask.